This property has two Lodges; a 1 bed and a 2 bed Lodge. This listing is for the 1 bed Lodge only. Please view our other listing for the 2 bed Lodge. Below is a brief description of the Lodges. For floor plans and layout, please see our website. There is both a 1 bedroom lodge and a 2 bedroom lodge, both with split level and open plan living. They float above the sloping landscape, positioned to take full advantage of the view and sun and to offer complete privacy for our guests. Living/dining/kitchen spaces with panoramic views and polished concrete floors open to a timber deck with BBQ and deck chairs. Luxurious living complete with wood fired heater, library, flat screen TV, DVDs and CDs. The contemporary-style kitchen features stainless steel appliances and everything you need to self-cater. It comes well equipped with fine crockery, cooking utensils and the essential basics - coffee, tea, olive oil, vinegar, salt, pepper and herbs. The lodges are designed to incorporate the best practice of eco design, with no sacrifice to comfort and luxury - the secret is in the efficient use of energy and resources. The property was selected for its spectacular views to the northeast, with the contours of the land forming a natural amphitheatre to the view. It was used for many years for market gardens due to its rich soil and natural spring before being abandoned and overrun with noxious weeds. Extensive rehabilitation and advance planting of the site was therefore necessary to prepare it for the Mount View Lodges. Trees and shrubs, such as spotted gum and peppercorn, were chosen for their suitability to the area, their ability to attract birdlife and for fire resistance. The plantings were placed around the perimeter of the site and between the buildings to maximise privacy. The buildings are sited along the contours of the slope with views over the valley below. A large spanning steel floor structure generates minimum disturbance to the landscape. Mt Bimbadeen to the west shields the property from the harsh afternoon sun. The living areas feature extensive north-facing glass to capture the sun and the view. Their polished concrete floors absorb the heat of the sun, keeping it cool in summer and radiating warmth back into the room in winter. Natural ventilation has been maximised in the design through the use of louvres, and \\'stack\\' ventilation achieved by employing smaller openings to the south (in the timber-clad bedroom areas) and through the central skylight. Photovoltaic cells on the roof transmit power to the electricity grid, to offset power used in the lodges. Hot water is supplied by solar panels. The monopitched roof collects rainwater into two tanks. A wet composting sewerage system deals with waste, which is dispersed within the site more than 40 metres from the watercourse on the property to prevent contamination Materials used for the construction of the lodges have been selected based on conservation of energy. This is either in their original manufacture or by their potential to be recycled. Timbers are radiata pine where concealed, and recycled or new growth spotted gum. Internal walls are generally lined with laminated plywood which is fixed to easily permit reuse. The ceilings are miniorb Colorbond steel sheet which is also easily removed. The bedrooms are carpeted in wool. Bathrooms are fully tiled. 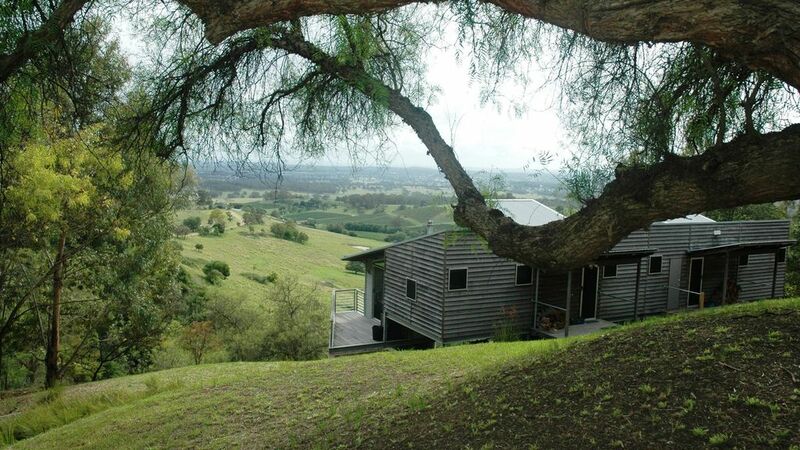 Mount View Lodges are located at the southern end of the Pokolbin vineyard district in the Hunter Valley, within easy driving distance of Sydney and Newcastle. Located near Cessnock, they can be reached from Sydney via the F3 or on the scenic \\"back way\\" through Central Mangrove and Wollombi. The six Mount View vineyards are close by, and the Pokolbin vineyards and restaurants are just a short drive away. There are also several top class golf courses in the area. If you\\'re in the mood for a walk, the Pokolbin branch of the Great North Walk passes just above us. Walk to Pokolbin in one direction or to Paxton Pub in the other. Take Wollombi Road, turning into Kendall Street at Bellbird. Kendall St becomes Bimbadeen Rd when it reaches open countryside. The first intersection is with Mt View Rd - we are down on the right. The entrance is about 50 metres along Mt View Rd. Up to 30 days prior to your stay, the deposit will be refunded in full. Less than 30 days prior to your stay the deposit will be refunded if the Lodge is re-booked. Within 10 days or less of your stay- no refund is applicable. Excellent view. The room was well organised, tidy and had everything we needed to make our stay memorable. We would be visiting it again. Stayed here for 2 nights and loved it. Everything from the coffee machine to the hamper provisions was great. And the view looking down the mountain was wonderful. The only issue we had was with the ceiling fan in the lounge room. Was a very hot weekend and the fan spins in the opposite direction so the wind blows upwards instead of downwards. With no air conditioning in that part of the unit (a/c only in bedroom), made it a little uncomfortable. A simple fix, I'm sure. We loved staying at this property. Beautiful views. Super relaxing. The property owners had thought of everything. My only suggestion is to add an ipod dock. The food provided for breakfast was so fresh and they had thought of everything. It was so great to wake up and cook our own breakfast before heading out for the day visiting the vineyards. There is a beautiful restaurant, Bistro Molines, down the road and we highly recommend eating there too. We would happily stay at this property again! Loved it. We thoroughly enjoyed our weekend stay! The property is very well maintained in a beautiful quiet location, with amazing views. The breakfast provisions were also a very nice touch. Would happily return! We stayed in the one bedroom lodge for our anniversary and it was exactly what we needed. We had a lovely, indulgent and relaxing weekend. It's such a pretty and peaceful location with gorgeous views. Even though we were keen to check out the wineries, we were tempted not to leave the lodge. We even cancelled our Sat night restaurant reservation to stay home and eat cheese and drink wine by the fire. The bed was comfortable, the shower was huge and light-filled, the kitchen was great and the food provided was wonderful. Although I was a bit disappointed to miss out the brownies which I had read about in other reviews. Literally the only thing I could suggest is to provide bodywash and ketchup/BBQ sauce for the bacon and eggs. Otherwise the lodge was perfect and Sam was great to liaise with. Highly recommend.